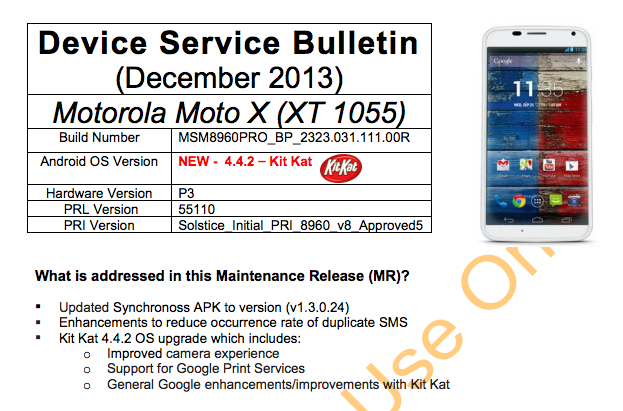 At the end of last week, we saw soak test invites of a new software update go out for the T-Mobile variant of the Moto X. It would make sense that the T-Mo version would see updates quickly, since it’s not exactly attached to the carrier and essentially sold as an unlocked device. But that news made us wonder which carrier variant would then be next in line? Would it be Verizon? Maybe AT&T this time around? Actually, it looks like it will be US Cellular. According to sources, the US Cellular variant (XT1055) is scheduled to receive the update as early as today, with the full rollout happening by February 12. Once updated to Android 4.4.2, users should see an improved camera experience, support for Google Print services, and other enhancements.